PLS members took the time to design and display their creations at the 2019 CFMS Annual Show and Convention. The CFMS Show Is On! 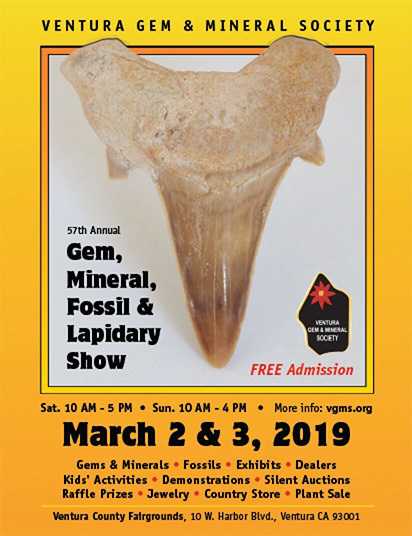 Over 50 dealers are selling their wares: Gems, minerals, slabs, jewelry, fossils, cabochons, and a whole host of other goodies! There are also fun activities for the kids (and adults, too—no judgement here) including rock grab bags, sand scoops, spin-the-wheel, and gold panning. And don’t miss out on the raffle and silent auction for a chance at great prizes. See you at the Pomona Fairplex! With the snow-capped Sierras in the very distant background, our little meteorite and Golden Bear pose for the Earth to Sky Calculus camera. The Pasadena Lapidary Society (PLS) just sent a meteorite slice back to space!! PLS members engaged the Earth to Sky Calculus Club to launch a helium balloon carrying a pallasite meteorite slice from a launch site near Bishop, CA, up 95,000 feet into the stratosphere, often called “the edge of space”. A pallasite meteorite is a rare type of stony-iron meteorite containing olivine crystals of peridot in an iron-nickel matrix. The meteorite weighs 9.75 grams and was found originally in the Republic of Belarus. The balloon traveled over the snowy Sierra Nevada of central California on February 23, 2019. After the balloon popped, the meteorite was parachuted back to Earth, landing on the eastern edge of Death Valley National Park, where it was recovered the next day. The meteorite will be on display at the upcoming California Federation of Mineralogical Societies (CFMS) Gem and Mineral Show, March 8-10, 2019 at Fairplex, Expo Hall 6, in Pomona. An image of the meteorite will be viewable in the days to come by way of spaceweather.com. It will be back-dropped against the blackness of space and the curvature of the Earth, in a frame announcing the CFMS Show, along with a ‘Golden Bear’ figure (unofficial mascot of the CFMS). PLS, a non-profit organization, is co-hosting the CFMS show, entitled California’s Natural Treasures. The show features many exciting things to experience: a Kid’s area with fun games about rocks, minerals and fossils; grab bags containing rocks, crystals, and minerals; special exhibits such as the aforementioned meteorite, display cases where members of different rock and gem societies in the CFMS show off their talents and compete for awards; gold-panning for real gold; wonderful, highly-coveted raffle prizes made and donated by PLS members; a silent auction with colorful rock slabs, collectible mineral specimens and other items; live demonstrations of jewelry making and other lapidary skills; dealers with meteorites, gems, minerals, jewelry, fossils, tools, equipment, books, maps, and many other unique items. Admission is $5 for adults, $4 for teens 12-17, seniors (60+) and active military; Free for kids under 12, accompanied by paying adult. Hours are 10-5 Friday and Saturday, and 10-4 Sunday. The Pasadena Lapidary Society hosts the 2019 CFMS Show at the Fairplex in Pomona, Building 6. Enter at Gate 17 from McKinley Ave.
How-to demonstrations: carving, wire-wrapping, grinding/polishing, chain-making, and more! Save the Date for the Ventura Show – But Don’t Forget About Our Show the Following Weekend! Looking for something fun to do next weekend, if you’re not going to Quartzsite or out of town? Check out the Pasadena Bead & Design Show at the Hilton Pasadena. Shop for artwear, clothing, gemstones, textiles, antiquities and supplies; or attend a workshop and create beads, jewelry and artwear. Explore bead & design January 18-20, 10 a.m. to 6 p.m. daily. $8 admission online or $10 at door. * Discounted parking. PLS member extraordinaire Janie Duncan will present ‘A Brief History of Beads’ at our first program meeting of 2019. Practically everyone knows what beads are but for those who’ve been hiding under or looking at rocks too long, a bead is a small, decorative object that is formed in a variety of shapes and sizes of a material such as stone, bone, shell, glass, plastic, wood or pearl and with a small hole for threading or stringing. Beads range in size from under 1 millimetre (0.039 in) to over 1 centimetre (0.39 in) in diameter. PLS VP Mona Ross will present the Rock of the Month talk on Psilomelane. A group name for hard black manganese oxides including hollandite and romanechite, psilomelane consists of hydrous manganese oxide with variable amounts of barium and potassium. Psilomelane is erroneously, and uncommonly, known as black hematite, despite not being related to true hematite, which is an iron oxide. Come to learn and make new friends; open to the public, free admission. Tuesday, January 15 at 6:30 p.m., in the Donald Wright Auditorium of the Pasadena Central Library at 285 E. Walnut St., Pasadena, 91101.